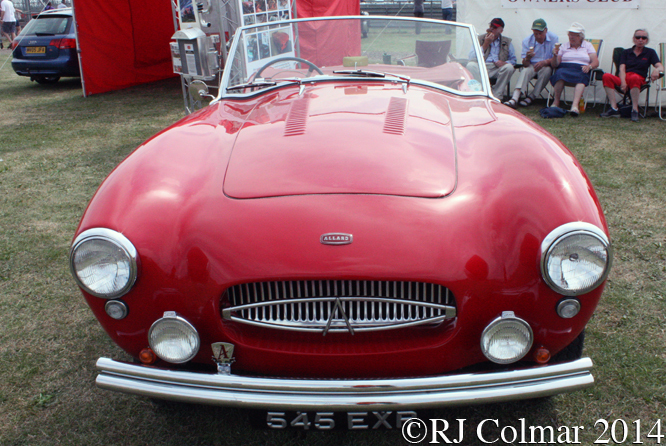 Based in Adelaide, Australia Jack Waye built today’s featured Waye 500 in 1953 and painted it red. Featuring a pair of conventional if no longer on trend transverse leaf springs front and rear the Waye was orignally powered by a JAP speedway engine fitted with a Norton gearbox. Jack sold the Waye 500 to Kevin Fuss in 1955 and in the ’56 / ’57 off season Kevin swapped the JAP motor for a Manx Norton, and made sprockets with different ratio’s for hillclimbing and circuit racing. 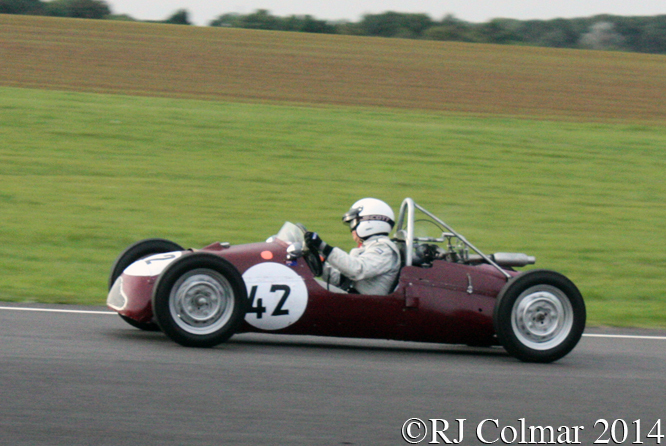 While Kevin mostly drove the car while it was in his ownership, until 1966, on one occasion Bernie O’Hare was credited with recording a top speed of 98mph at the wheel of the Waye 500 at Collingwood. 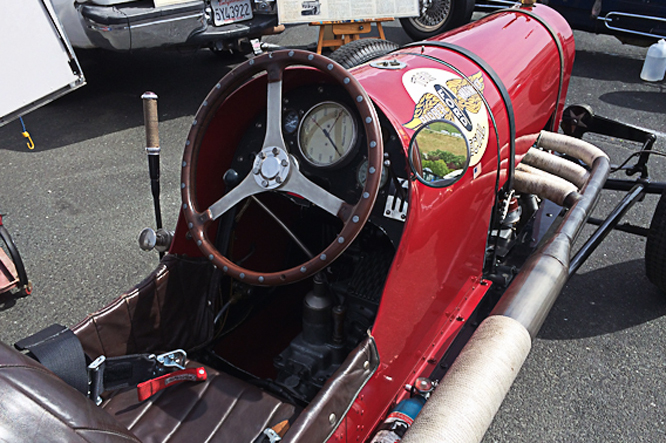 John Vinall became the third owner of the Waye 500 but only raced it until the end of 1967 when he discovered cracks in the flywheel. John and his fiancee were killed in a road accident four years later and it was not until 1993 Waye 500 ran again after his brother David had the engine overhauled. 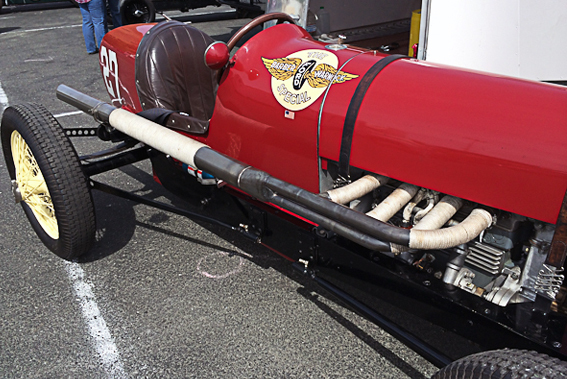 The overhauled engine did not run well after it’s second practice run and the car was put back into storage until it was bought by David and Andrew Halliday in Sydney, Australia. 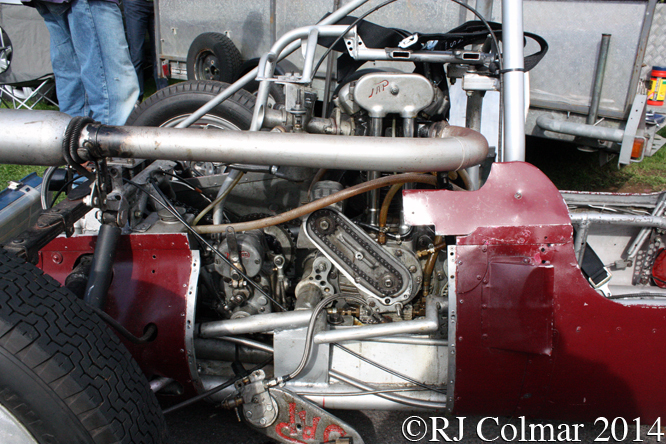 When they removed the Manx Norton to fit it into a Cooper they discovered that the timing had slipped which is what had caused the engine to malfunction in 1993. 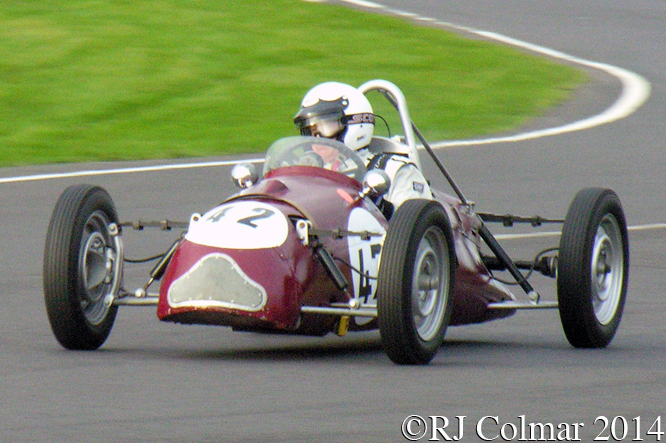 In 2011 Andrew Halliday advertised the Waye now fitted with a JAP engine again and it was bought by Doug Yates, who is seen at the wheel in these photographs at Castle Combe. My thanks to members of The Nostalgia Forum who contributed to the Motorbike powered race cars 1950 to 1980 thread, particularly Greg Mackie and John Medley and to one lung who contributed to the Personal photos of Australian motor racing ’50s to ’70s thread all of which helped lead to discovering that J Waye was the most likely candidate to have built the Waye 500.
b) sharing details about the Waye 500 with editor Graham Howard, producer Terry Wright and publisher Garry Simkin who ran a small article, on which most of today’s blog is based on, in the 2nd edition of Loose Fillings published in Winter 1999. Thanks for joining me on this “Jack’s 500” edition of “Gettin’ a li’l psycho on tyres”, I hope you will join me again tomorrow when I’ll be looking at a Leyland Concept car with a square wheel. Don’t forget to come back now ! This entry was posted in Uncategorized and tagged 500, Autumn, Blog, Bolly, Castle, Classic, Colmar, Combe, Fillings, Forum, Fuss, Halliday, Howard, JAP, Loose, Low, Lung, Mackie, Medley, Norton, Nostalgia, O'Hare, Psychoontyres, Ralph, Simkin, The, Vinall, Waye, Wright, Yates on March 26, 2016 by Ralph. After migrating from Switzerland to France and before migrating to North America Louis Chevrolet had a career as a successful racing cyclist and at one stage built and sold his own cycles under the Frontenac brand. Later he would move into the French motor industry before migrating to the United States in 1902 where he became a successful mechanic and racing driver. While Louis lead driver for the Buick Racing Team General Motors ousted founder William C Durant founded the Chevrolet Motor Car Company with Louis in 1911. By 1915 Louis and William had fallen out over William’s plan to offer cheaper products with the Chevrolet brand, William bought Louis out and went on to regain control of General Motors in 1916 before being dethroned by shareholders a second time in 1920. Meanwhile in 1915 Louis raced a Cornelian, the first monocoque raced in the Indy 500, before using the name of the 17th century governor of France’s North American colonies for a second time to found the Frontenac Motors Corporation, specialising in competition vehicles with his brothers in 1916. Frontenac built the cars that won the 1920 and 1921 Indy 500 races for Gaston Chevrolet, who would die at the wheel of a Frontenac on a West Coast board track in November 1920, and Tommy Milton respectively. By 1922 no less than nine Frontenacs started the Indy 500, from a field of 27, with Tom Alley finishing a marque best of 9th from a 12th place start. Also in the 1922 Indy 500 field were two Fronty Fords which used modified Ford Model T chassis and Frontenac modified Ford motors for Jack Curtner and C Glen Howard which finished 14th and 18th respectively. Barber Warnock Ford entered a single Fronty Ford for LL Corum who finished 5th at Indy in 1923. In 1924 Barber Warnock Ford entered 3 Fronty Fords for Bill Hunt, future Stirling Moss’s father Alfred E Moss and the #27 Fred Halder who finished the Indy 500 in 14th, 16th and 17th places respectively. Fronty Fords appeared at Indy in 1925, ’30 and ’31 with MC Jones, Chet Miller and Gene Haustein respectively but none of them finished inside the top ten. 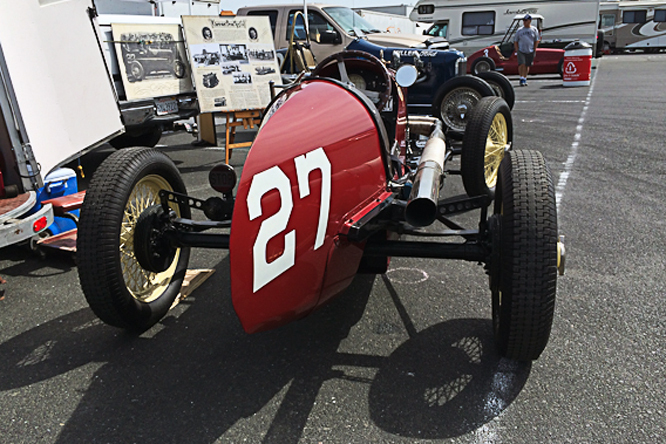 My thanks to Geoffrey Horton for sharing today’s photographs of the #27 Ford T Fronty Ford seen at last years Sonoma Historic meeting. Thanks for joining me on this “Indy Tin Lizzie” edition of “Gettin’ a li’l psycho on tyres” I hope you will join me again for Pick Up Monday tomorrow. Don’t forget to come back now ! 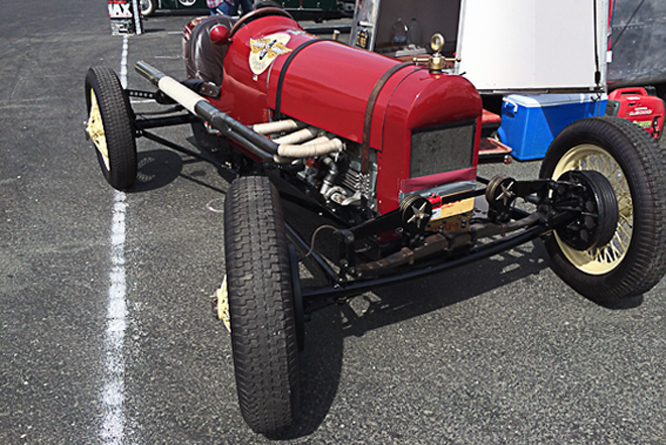 This entry was posted in Uncategorized and tagged Alley, Buick, Chevrolet, Colmar, Corum, Curtner, Durant, Ford, Frontenac, Fronty, Geoffrey Horton, Halder, Haustein, Historics, Howard, Jones, Miller, Milton, Moss, Psychoontyres, Ralph, Sonoma, T on May 10, 2015 by Ralph. 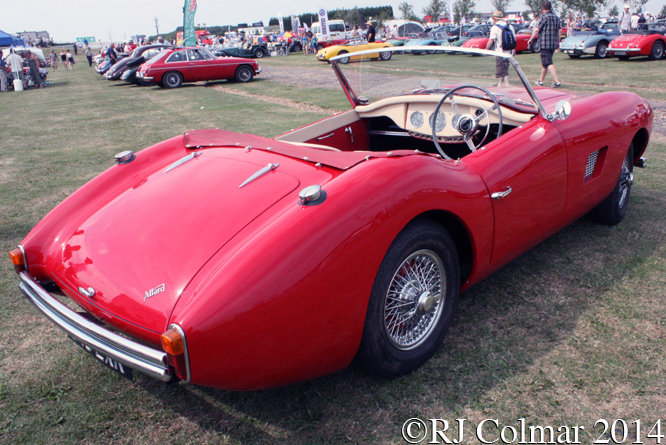 At the 1956 Earls Court Motor Show Allard showed today’s featured car, the prototype Palm Beach Mk2, seen in these photo’s displayed by the Allard Owners Club at Silverstone Classic. 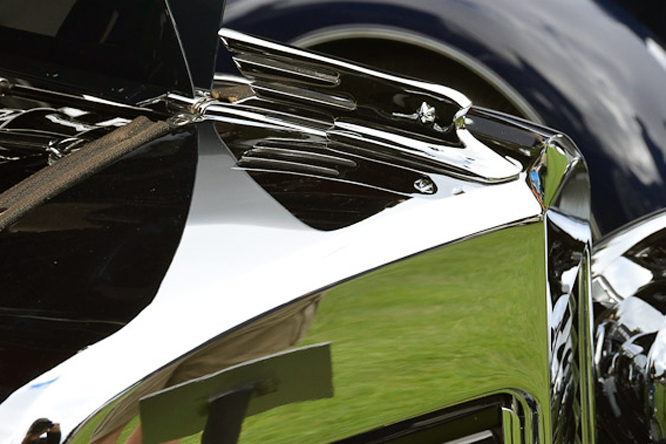 External differences from the original Palm Beach included hidden door hinges and vents behind the front wheels and more comprehensive grill ornamentation. Internally the four cylinder motor option was dropped and a Jaguar six cylinder was available to complement the base models 120 hp Ford Zephyr six cylinder motor as fitted to the prototype. 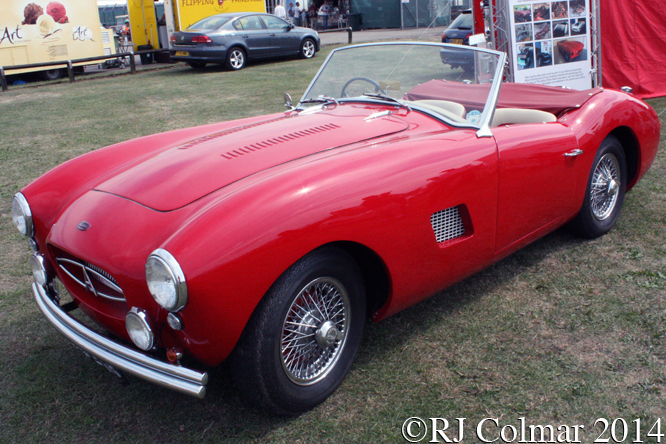 In November 1956 today’s featured car was registered for the road and used as a demonstrator and later by Allard Motor Companies Brian Howard. 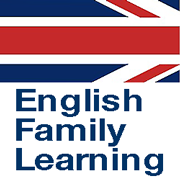 In 1969 it was sold to the Hemsworth family where it remained until 2012. The car, one of just six MkII’s built upt o 1958, was offered for restoration to Sidney Allards son Alan and grandson Lloyd having not turned a wheel since 1976 and being kept outside for several years. Two years on and the restoration of the aluminium bodied prototype Palm Beach Mk II is complete with Lloyd Allard having been credited with doing most of the dirty work. During the restoration a resurrection of Allard has also taken place now known as the Allard Sports Car Company with the initial aim of manufacturing a continuation Mk III Palm Beach and continuation Cadillac powered JR as raced at Le Mans in 1953 and through out the USA in later years. Thanks for joining me on this “Prototype Family Restoration” edition of “Gettin’ a li’l psycho on tyres”, I hope you’ll join me again for bank holiday Maserati Monday tomorrow. Don’t forget to come back now ! 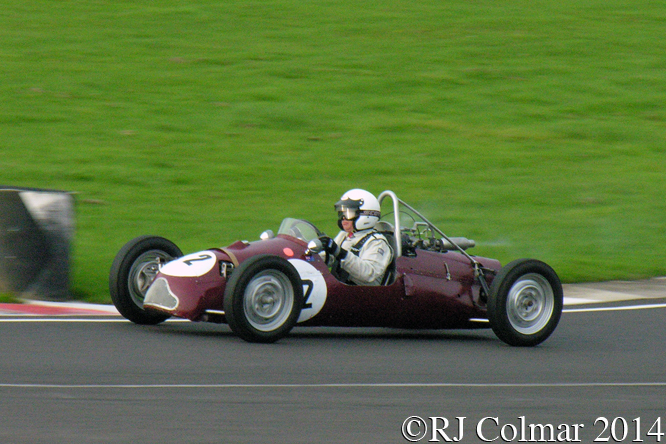 This entry was posted in Uncategorized and tagged Alan, Allard, Club, Colmar, Ford, GALPOT, Hemsworth, Howard, Jaguar, Lloyd, Mk II, Owners, Palm Beach, Ralph, Silverstone Classic, Sydney, Zephyr on August 24, 2014 by Ralph. At the 1973 South African Grand Prix 1967 World Champion New Zealander Denny Hulme qualified on pole for the first and only time in his entire formula one career which lasted from 1965 until 1974. Remarkably he was driving a brand new Ford Cosworth powered McLaren M23, #M23/1 featured today, that was designed by Gordon Coppuck and which was to replace the Ralph Bellamy designed McLaren M19C. The design of the M23 was broadly similar to the design of the 1972 turbo Offy powered McLaren M16 which Mark Donohue drive to victory in the 1972 Indy 500, except in the DFV motor of the M23 was bolted into the chassis rather to a sub frame and the side radiators of the M23 were surrounded by a deformable structure to protect the fuel tanks in the side of the chassis. Denny Hulme came fifth in the 1973 South African Grand Prix which was won by Jackie Stewart driving a Tyrrell 006. At the 1973 Swedish Grand Prix Denny Hulme took the first of the M23’s 16 World Championship race victories, two races later Peter Revson scored the models 2nd victory at the British Grand Prix a feat Peter would repeat at the Canadian Grand Prix towards the end of the season. Despite scoring two more wins than in the previous season McLaren again finished third in the 1973 World Constructors championship as they had in 1972. 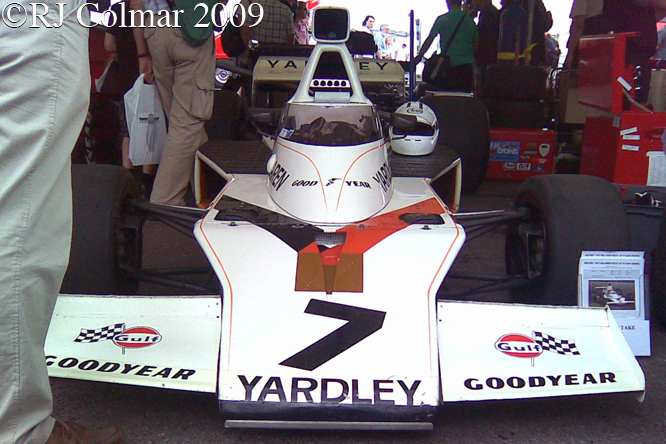 For 1974 McLaren again attracted BRM’s sponsor Philip Morris and the Marlboro brand, Yardley having sponsored BRM in 1970 and 1971 prior to joining McLaren for 1972. Peter Revson moved to join the UOP Shadow outfit and was replaced at McLaren by 1972 World Champion Emerson Fittipaldi from Lotus. Emerson won three world championship races in 1974 on his way to his second World Drivers Championship and McLaren’s first World Constructors Championship, backed up by Denny Hulme who won the first race of the 1974 World Championship season in Aregetina which would be his last prior to retiring from the sport at the end of the season. Chassis #M23/1 was used in the early 1974 season by a third Yardley backed factory entry for Mike Hailwood who joined McLaren from Surtees. Mike ‘the Bikes’ best result was third in the South African Grand Prix which would become his career high world championship result. An accident in Germany at the wheel of another M23 prematurely terminated Mikes driving career, though he would return to motor cycling at which he was a seven time world champion and add two Isle of Man TT trophies in 1978 and 1979 to bring his total to fourteen. In 1975 Emerson claimed two more championship victories on his way to second in the title behind Niki Lauda in the superior Ferrari 312T which had a more powerful motor and superior handling thanks to a transversely mounted gearbox and the testing skills of it’s driver. Another Surtees refugee Jochen Mass who had teken over Mike Hailwoods Yardley McLaren drive in 1974 replaced Denny Hulme and scored his only Grand Prix victory at the ill feted 1975 Spanish Grand Prix. James Hunt replaced Emerson Fittipaldi for 1976 and McLaren ended up using the M23 for a forth straight season as they were locked in an epic battle with Niki Lauda for the 1976 title that has been immortalised by Ron Howard in the film “Rush” released earlier this year. On his way to the 1976 World Drivers Championship James won 6 races to become the M23 model’s most successful driver. By 1977 the M23 was pressed into a fifth season of competition as a works racer before a much modified McLaren M26 was finally brought up to speed mid way through the season, non works McLaren’s were used sporadically in World Championship events until 1978 when rising star Nelson Piquet recorded a 9th place finish in the Canadian Grand Prix on what was to be the M23’s final World Championship appearance. Tony Trimmer won the British Formula One Championship driving a Melchester Racing McLaren M23 in 1978. Thanks for joining me on this “Fragrant Debut Pole” edition of “Gettin’ a li’l psycho on tyres” I hope you will join me again tomorrow. Don’t forget to come back now ! 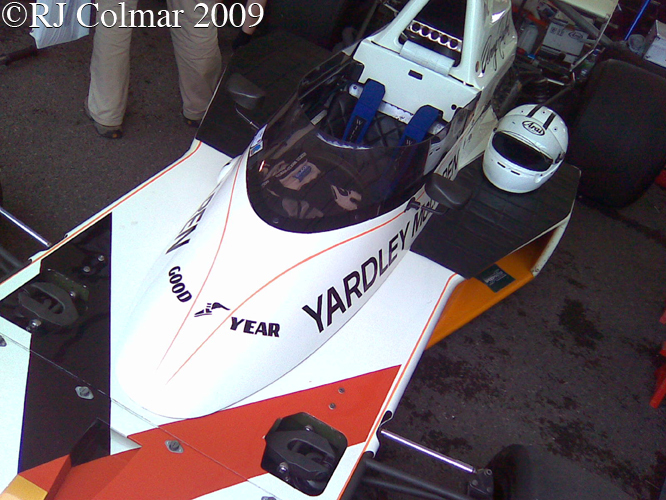 This entry was posted in Uncategorized and tagged Colmar, Coppuck, Cosworth, Donohue, Festival of Speed, Fittipaldi, Formula One, GALPOT, Goodwood, Hailwood, Howard, Hulme, Hunt, M16, M23, Mass, McLaren, Melchester, Philip Morris, Piquet, Racing Car, Ralph, Revson, Rush, Trimmer, Yardley on November 17, 2013 by Ralph. 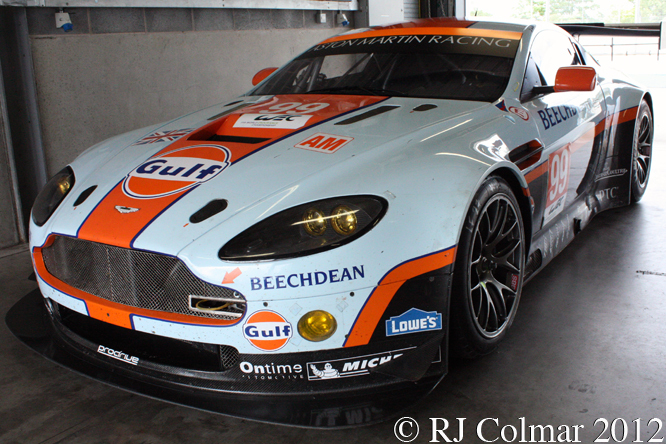 In 2012 Aston Martin returned to racing a GT programme with up to three Gulf sponsored works cars, split between the Pro and Am subdivisions, appearing in last seasons Le Mans Series races. 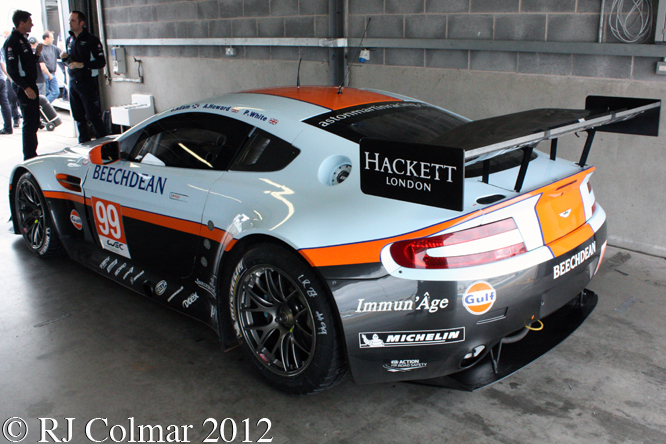 The GTE is similar to the previous GT2 incarnation of the Vantage V8 though it is lighter, features improved cooling for the driver, has improved aerodynamics and also improved serviceability which means that the motor can now be changed in an hour without altering the suspension settings where as previously the same operation took four hours. 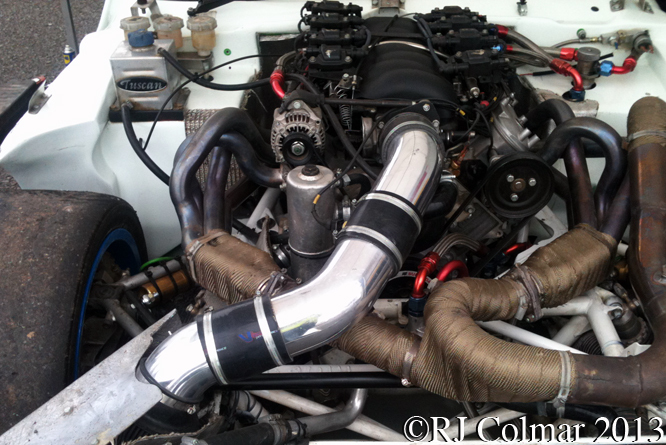 The dry sump lubricated 4474 cc / 273 cui V8 motor produces 600 hp that is transmitted to the rear wheels by a six speed X-trac sequential semi automatic gearbox that is operated by paddle shift from the steering wheel. A carbon fiber prop shaft is fitted between the gearbox and rear axle. To bring the car to rest ventilated disc brakes are used with six pot calipers on the front and four pot calipers at the rear. Helping to keep the dry weight down to 1195 kgs 2634 lbs are a lithium battery, carbon fibre body panels and seat. At Le Mans last year two GTE’s were entered the #97 Pro car driven by Adrian Fernandez, Stefan Mücke and Darren Turner finishing 19th over all 3rd in class while the #99 Am car driven by Danes Allan Simonsen, Christoffer Nygaard and Kristian Poulsen after 31 laps. 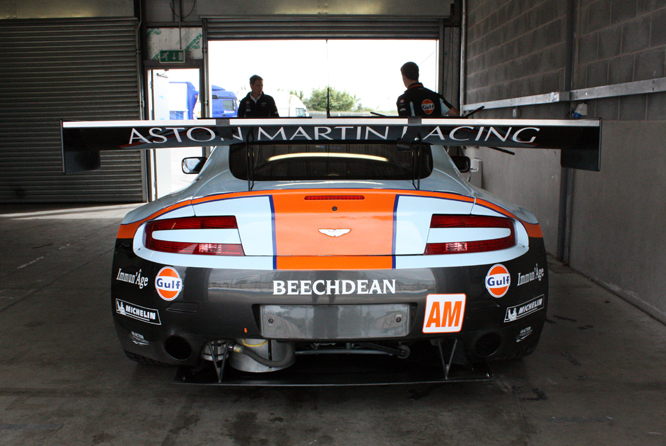 Last season Aston Martin finished 2nd in the LMGTE Pro series with one class win and six further class podiums. 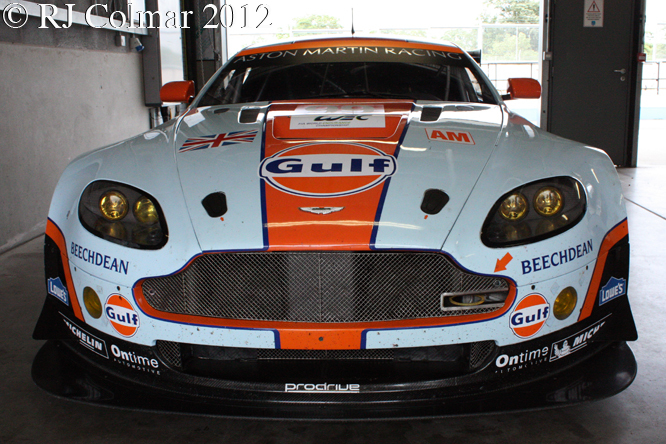 At the time of writing the week before Le Mans Aston Martin are leading both the Pro and Am 2013 LMGTE series. 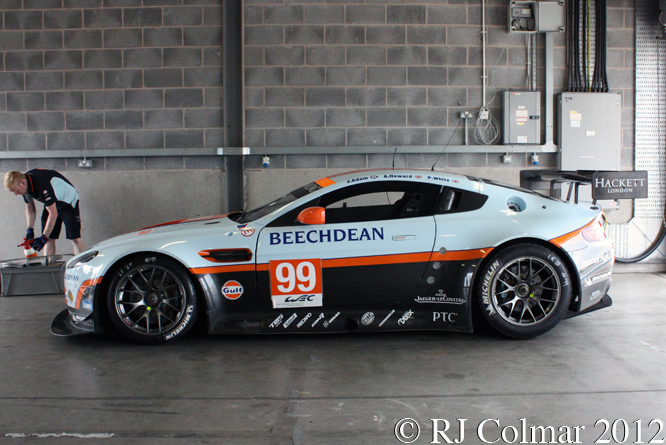 The #99 featured today is seen at a test day at Donington Park prior to the Silverstone Six Hour race where the car driven by Jonathan Adam, Andrew Howard and Paul White failed to finish. Thanks for joining me on this “Serviceability” edition of “Gettin’ a li’l psycho on tyres” I hope you will join me again tomorrow. Don’t forget to come back now ! 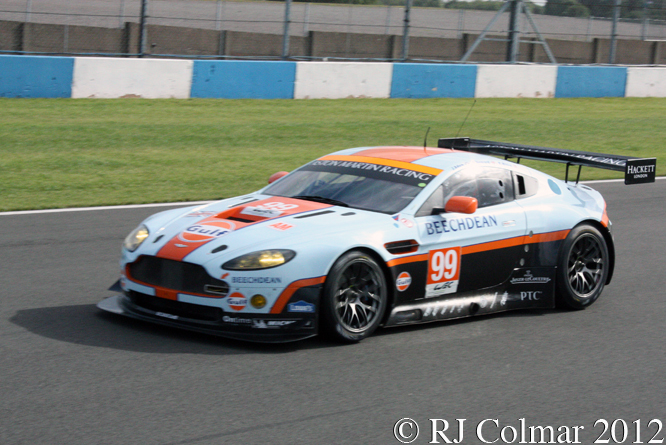 This entry was posted in Uncategorized and tagged Adam, Am, Aston, Donington Park, Fernández, GT2, GTE, Gulf, Howard, LM, Martin, Mücke, Nygaard, Poulsen, Pro, Silverstone, Simonsen, Turner, V8, Vantage, White on September 30, 2013 by Ralph. 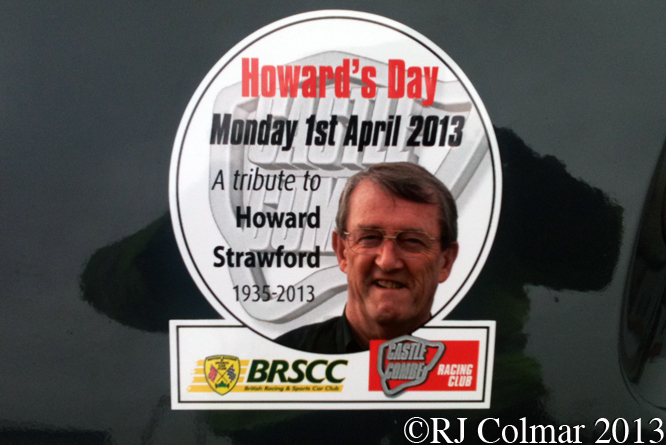 Easter Monday’s meeting at Castle Combe was dedicated to the memory of Howard Strawford who died on February 23rd leaving a huge void for not only his family and friends but also the greater Motorsport community in South West England. Howards legacy is the Castle Combe Circuit as it stands today which he saved from closure in the 1970’s after managing to secure the support of former World Champion James Hunt. By 1981 Howard had gained permanent planning permission to operate the track as a motor sports venue and engaged in a programme of continual improvements to the tracks facilities which have been to the benefit of both national and club motor sport. Belated condolences to Howards family and friends. 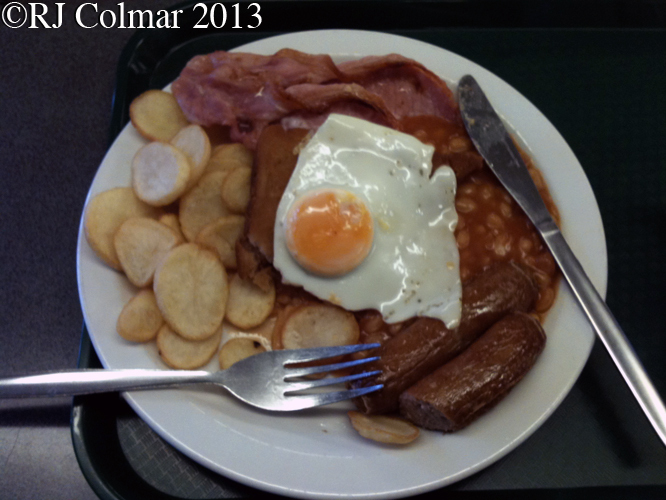 When I got to the circuit I headed straight for Tavern Club House where I had agreed to meet Ted the day before at Thruxton and enjoyed my second Big Boys Breakfast in 8 days. 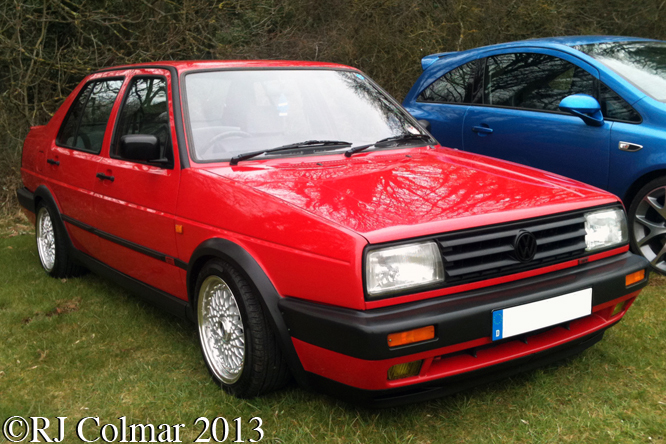 Afterwards Ted and I went for a stroll around the circuit when we stumbled across this immaculate 1989 VW Jetta GTi. As we walked round the track the wind picked up and it got sufficiently cold for Ted to decide to head for the warmth of his dark room while I wondered around the paddock where I stumbled across Martyn Walsh’s VW Golf GTi which qualified 9th for the first of the two BRSCC Teekay Couplings Production GTi Championship races and finished 7th in the first race and went one better in the second GTi race finishing 6th. 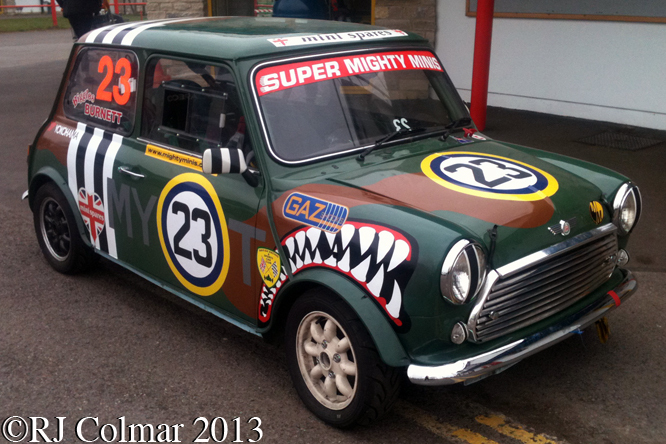 Mini’s were in abundance at Castle Combe with races for the 60 hp Mighty Mini’s and 90 hp Super Mighty Mini’s the #23 MerlinPoweredMini.com of Mark Burnett runs in the more powerful Super Mini class however on this occasion it appears he traveled from Guildford in vain having failed to set a qualifying time he recorded a did not finish (DNF) with zero laps completed in Race 1 and did not take the start in Race 2. 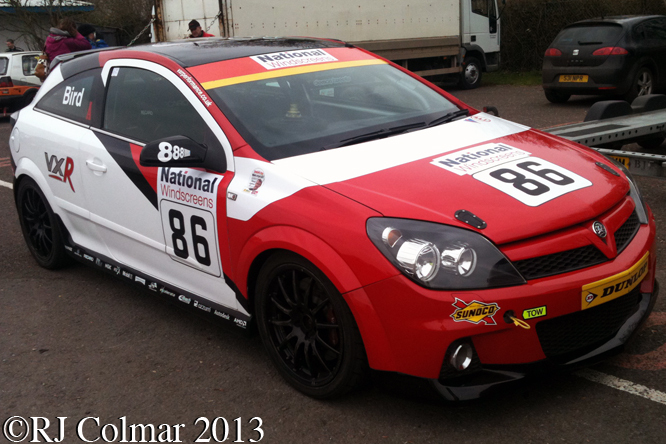 The Castle Combe Saloon Car Championship in Association with National Windscreens has some new entires this season including the #86 Vauxhall Astra of Kevin Bird who used to campaign a BMW 130i in this series. Kevin qualified 10th and finished 7th in the single race for the series. 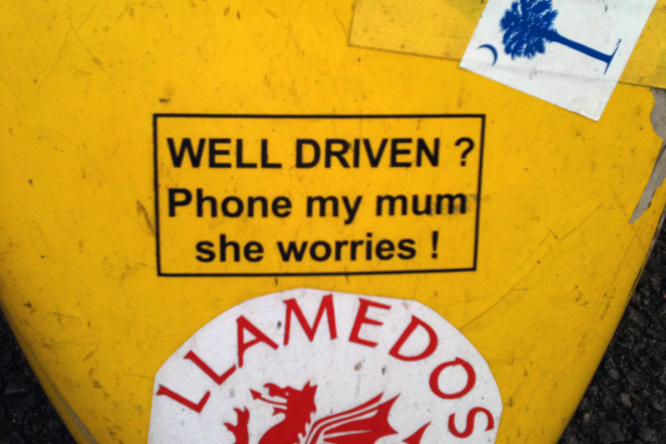 There appeared to be more stickers on Juiceie Bruceie’s BJ Welders Real Steel 4×4 / Llaemdos Racing Reynard FF84 than fibre glass, but as we shall see there was only one little incident Juiceie’s Mum might have had to worry about in the Formula Ford race for which he qualified a respectable 18th ahead of four newer vehicles. Perry Waddams used the prodigious horsepower of his Chevrolet LS3 motor to power his #77 Crowthorne.com TVR Tuscan to 12th on the grid and an 8th place finish in the Castle Combe, Sports & GT Championship supported by Siliconehoses.com. 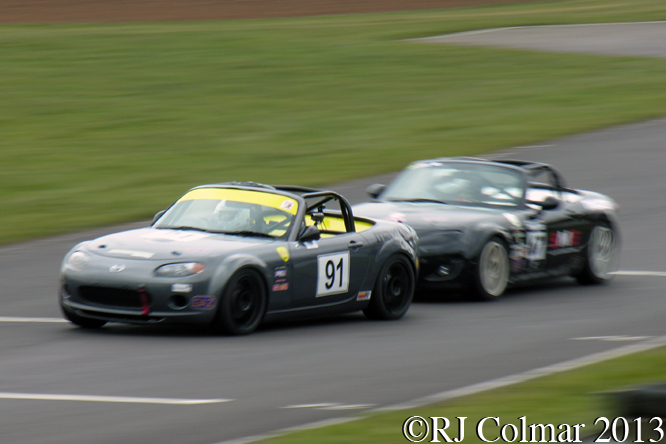 The first race in the 11 race programme only had 7 starters but it only takes two cars to make a race and Matthew Davies in the #91 Mazda MX5 Mk3 and Andrew Clarkson in the #67 Team SMG / Clarkson Electrical MX5 Mk 3 both wanted to win the first BRSCC Mazda MX5 SuperCup race of the day. Clarkson eventually won by less than a second from pole but only after at least 5 changes in the lead up to lap ten of the 15 lap race. 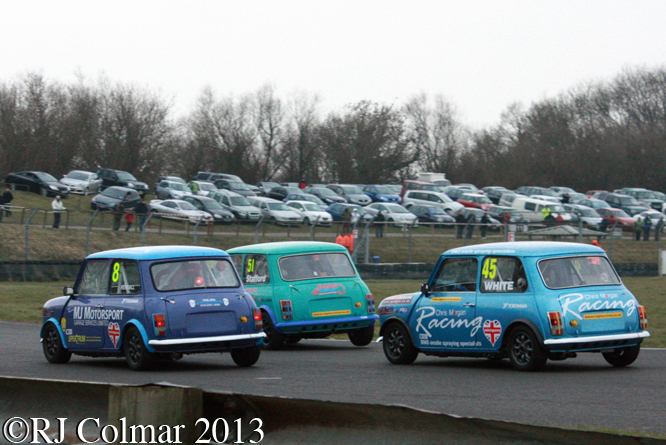 Jonathan Lewis driving the #2 Mighty Mini won the first BRSCC Mighty Mini Race from pole and is recorded as having led all but one lap however the race lead changed many more times particularly with Damien Harrington in the #53 Mini seen above leading on Westway leading into the final Camp Corner where Lewis was always ready and able to steal the lead back again. 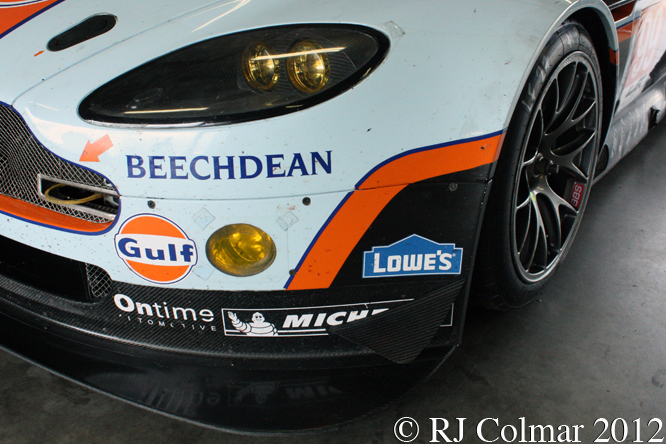 The winning margin was just .106 seconds after 13 laps. Simon Hill in his evil handling GTi provided the only opposition to pole sitter Lewis Hopkins in the BRSCC Teekay Couplings Production GTi Championship race, Lewis won the 11 lap contest by over 5 seconds. Further down the field #45 David Parris is seen in 10th place before retiring on lap 6 being chased through Bobbies chicane by #70 James Howlison, #83 Paul Blackburn and #56 Nick Jarvis who finished the 11 lap race in 9th, 10th and 11th places respectively. 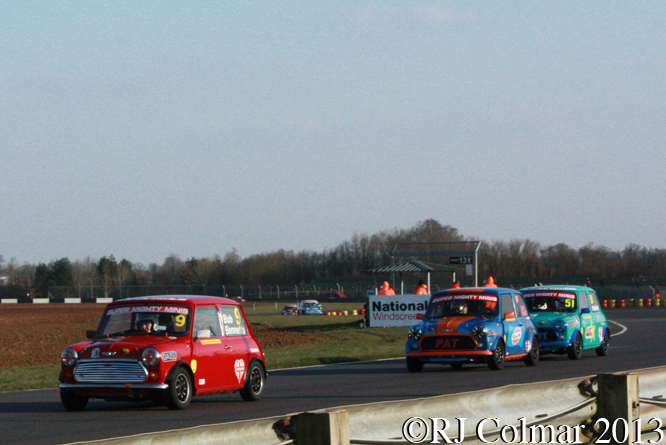 Next up was Race 1 for the Super Mighty Mini’s, Peter Trevett was swallowed up by the grid at the start and eventually finished fifth but it was Elliot Stafford who led by over a second until lap 6 when the pressure started to mount from Jamie White, Patrick Ford and Scott Kendall. #51 Elliot, who held on to win by less than a quarter of a second, is seen raising a rear wheel above as #8 Scott Kendall and #45 Jamie White try and find a way past going into Tower Corner. 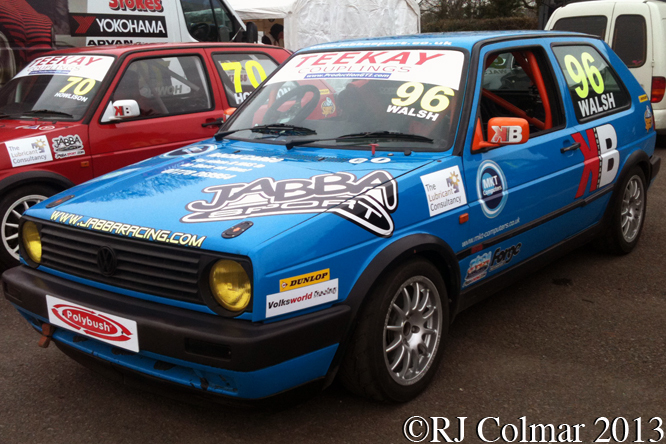 With the temperature in the tropical 3 degrees above freezing zone a great race looked in prospect from the Castle Combe Saloon Car Championship in Association with National Windscreens race, even though Mark Wyatt in his Vauxhall Astra had qualified nearly 2 seconds ahead of anyone else. 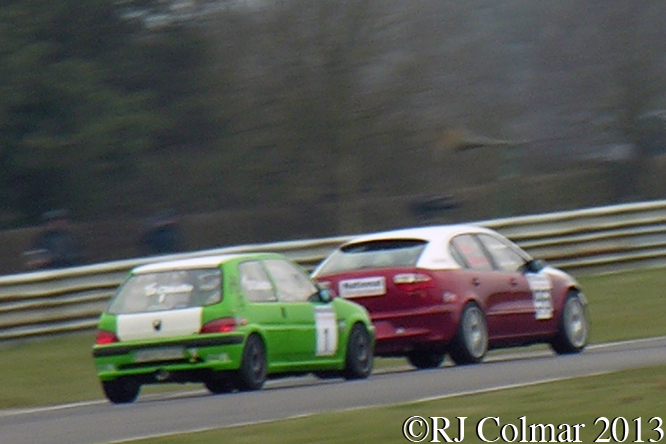 William di Cluadio made a race of it and led lap one in his green championship winning W-A-S Racing Peugeot 106 GTi but Mark was back in charge until lap 6 when he retired at Quarry. 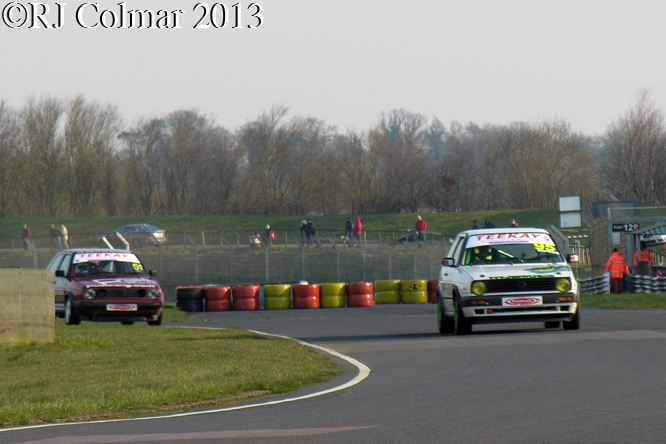 di Claudio led again until lap 10 when he finally succumbed to the superior power of Rob Ballards Chippenham Conversions / Interceptor Racing SEAT Leon 20v Turbo. 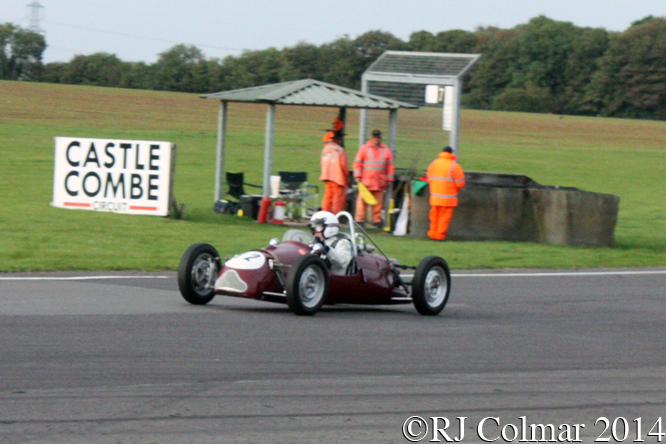 Rob is seen above having just over taken William out of Old Paddock on his way to a 1.5 second victory. 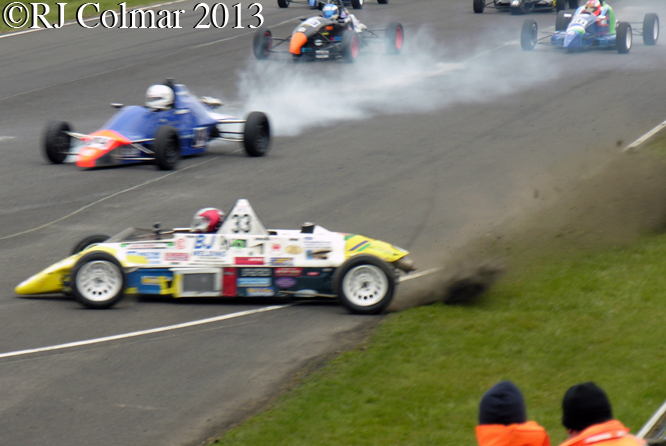 Steven Jensen started his 2013 Castle Combe Formula Ford 1600 Championship supported by StartLine with a convincing victory from pole, his only challenger was Roger Orgee who retired his #3 Van Diemen on lap 6. However down the field there was plenty of excitement, the aforementioned Juiceie Bruceie got his Reynard FF84 off to a brilliant start rising from 18th on the grid to 10th at the end of lap 1 before he appeared to out brake himself going into the Esses, Juiceie recovered and finished an eventual 16th one lap down. 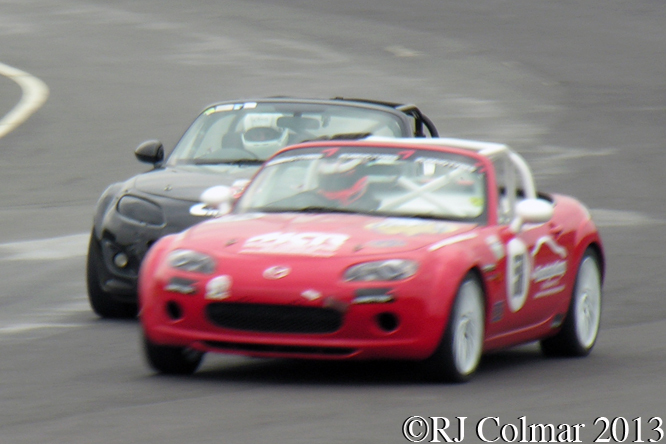 The second Mazda MX5 SuperCup race was won by Matthew Davies by six seconds from Andrew Clarkson in the #67 Mazda, who temporarily gave his second place up Mike Comber coming out of Quarry in the #58 MX5 as seen above. Mike could not make the pass stick over the remainder of the lap and settled for his second third place finish of the day. The Castle Combe Sports and GT Championship supported by Siliconhoses.com race did not live up to the expectations of a battle between the leading Radicals of pole sitter Josh Smith fellow front row starter Andrew Shanley and second row starters Manhal Allos and Simon Tilling, Tilling retired out on the circuit on lap 2 which required the safety car to neutralise the field on lap 6 and in the ensuing chaos Andrew Shanley was handed a one lap lead as a result of the wrong car being picked up as the leader. Still former drag racer Michael Kason’s Zubedo.com Dallara Fiat X1/9 provided plenty of flame spitting entertainment as it headed for a 16th place finish, which kept me occupied for the remainder of the race. 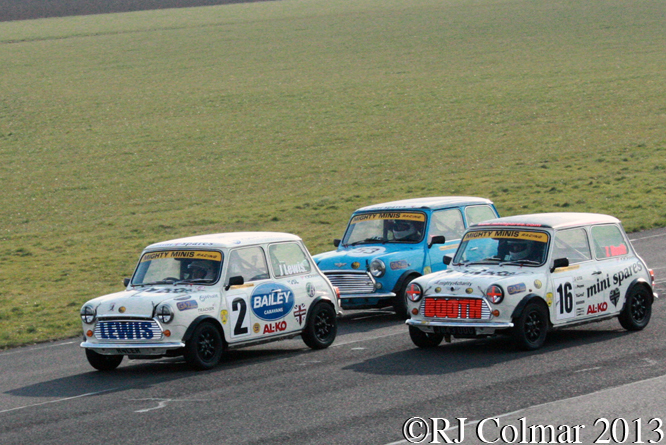 With 8 races down and 3 more to go the 60 hp Mighty Minis came out for their second run and it was a real barnstormer with Jonathan Lewis, teenager Zack Booth, Pole sitter Damien Harrington and Charlie Budd all leading at least one lap by never more than half a second. In the end Harrington pulled of a last lap last corner maneuver at the last corner Camp that stuck all the way to the finish line to win his second race of the day by .108 secs. Above #2 Jonathan Lewis, who finished 2nd, #16 Zack Booth, who finished 3rd and eventual winner #53 Damien dispute every inch of tarmac on the run up to Avon Rise midway through the race. 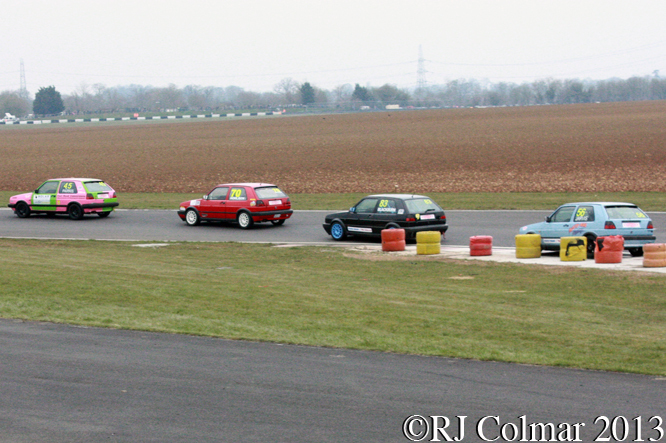 For a while it looked like Simon Hill had got on top of his handling demons which were much in evidence in the first Production GTi race but after just two laps the red #51 GTi had to concede to the faster white #95 of Lewis Hopkins who became the second two time winner of the day. 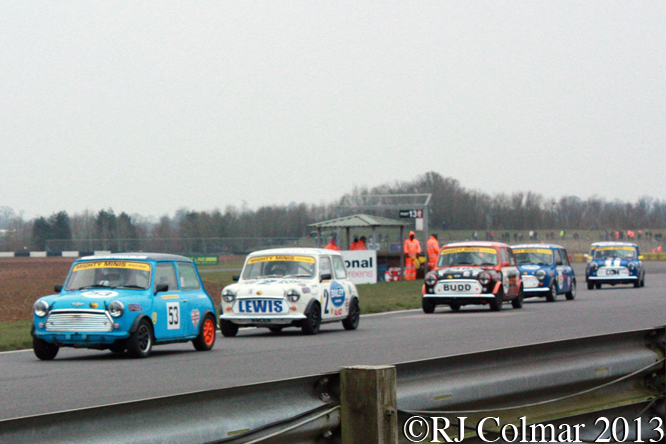 The Super Mighty Mini’s concluded the meeting with their second run and their was no going home early and guessing the result, above with two laps to go Bob Bennets, who would finish 3rd leads on lap 12, on lap 13 is was the turn of #77 Patrick Ford who finished 2nd to lead and at Camp Corner on the final lap Elliot Stafford nailed his exit perfectly to become the second two time winner of the day. As a tribute to Castle Combes much missed savior Howard Strawford the day had served as a poignant reminder to all that Howard had done for motor sport and the wonderful legacy and high standards that those of us who remain will have to live up to. Thanks for joining me on this ‘Howards Day’ edition of “Gettin’ a li’l psycho on tyres” I hope you will join me again tomorrow, don’t forget to come back now ! 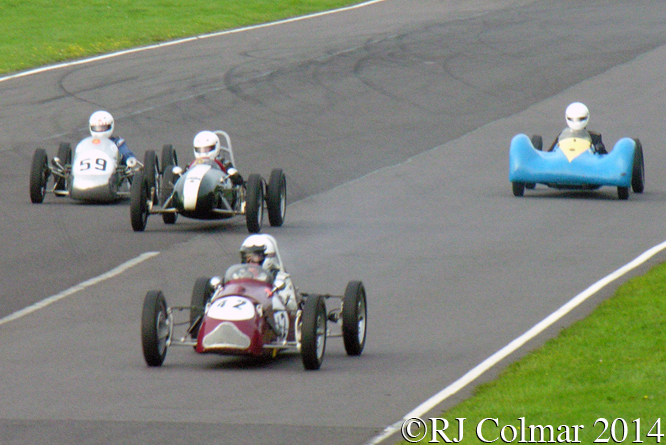 21/04/13 PS My thanks to Castle Combe historian Pete Stowe for pointing out various spelling errors in drivers names, apologies to all concerned. 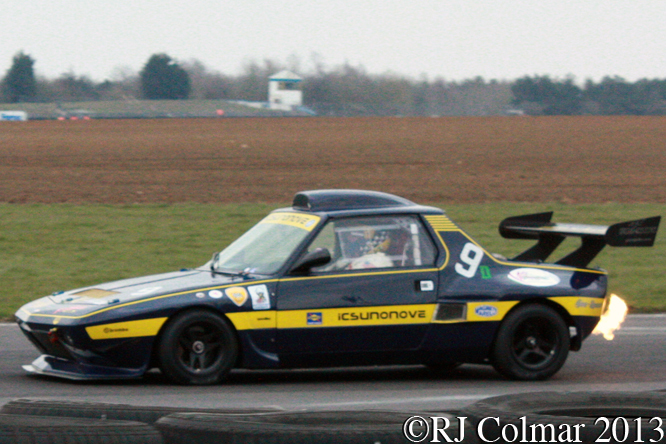 This entry was posted in Uncategorized and tagged Adams, Ballard, Bennets, Bird, Blackburn, Booth, BRSCC, Bruceie, Budd, Burnett, Car, Castle, Championship, Chevrolet, Clarkson, Colmar, Combe, Comber, Davies, Day, di Canio, Easter, FF 1600, FF84, FIAT X 1/9, Ford, GALPOT, Golf, GTi, Harrington, Hill, Hopkins, Howard, Howlison, Jarvis, Jetta, Kason, Kendall, Lewis, LS3, Mazda, Mighty, Mini, Monday, MX5, National Windscreens, Parris, Production, Ralph, Reynard, Saloon, Siliconehoses.com, Sports & GT, Stafford, StartLine, Strawford, Super, SuperCup, Teekay Couplings, Vauxhall Astra, Volkswagen, Walsh, White on April 10, 2013 by Ralph. The transformation of flour mill machinery manufacturers Nordyke and Marmon, est 1851, into the manufacturers of the Worlds most advanced car started with 23 year old University of California at Berkeley graduate Howard Marmon returned to Indianapolis and built his first car, powered by an aircooled V twin featuring a pressurised lubrication system and overhead valves in 1902. Howard’s second design was powered by an aircooled V4 and a couple of years later Marmon sold it’s first six cars, allegedly mostly to friends. Nine years after designing his first car Howard’s Marmon Wasp won the very first Indianapolis 500 in 1911 with Ray Harroun averaging 75 mph for the 6 hours, 42 minutes it took to complete the distance. 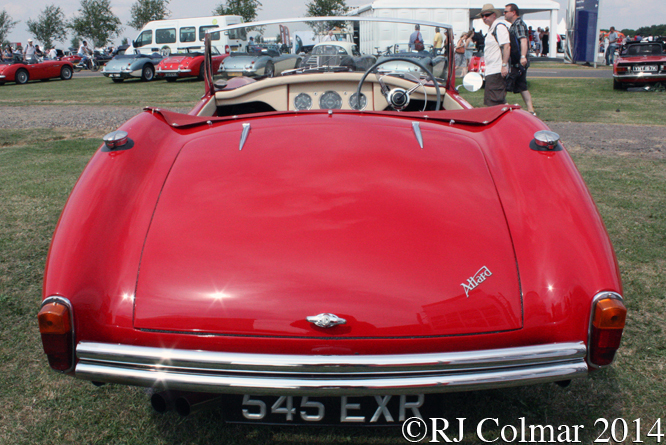 The Wasp is said to be the first car ever to feature a rear view mirror. After full fulfilling a contract to build 5,000 Liberty motors for use in the 1914/18 war Marmon had the financial stability to continue innovating especially with the use of aluminium in automobile manufacture and with motor configurations until in 1927 Marmon began the design of the highly advanced V16. The 8.1 litre / 491 cui V16 motor is a work of art featuring a ‘Y’ shaped block with a 45 degree V for the two banks of eight cylinders made from a single aluminium casting that includes the crank case. The excellent design of the engine was recognised by the Society of Automotive Engineers who’s annual design award was given to Howard Marmon. 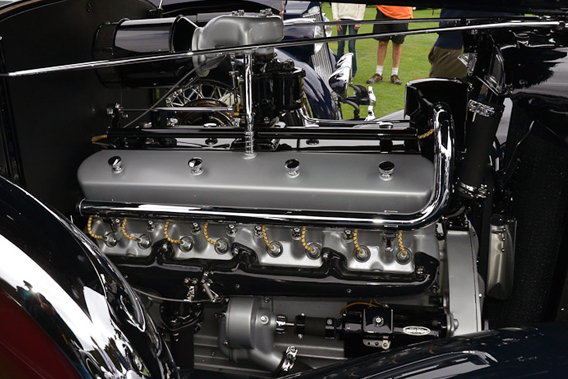 With overhead valves operated by pushrods from a single cam shaft the motor produced 200 hp and weighed much less than the smaller V16 that Cadillac had pushed through to production in less time than Marmon with the help of an ex Marmon employee. 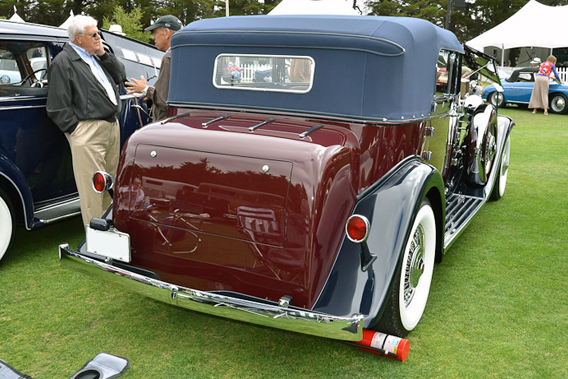 Most of the 390 Marmon Sixteens had bodywork by LeBaron with the design credited officially to Walter Dorwin Teague, Sr though much of the work was done by his son W.D. Teague, Jr an MIT student. 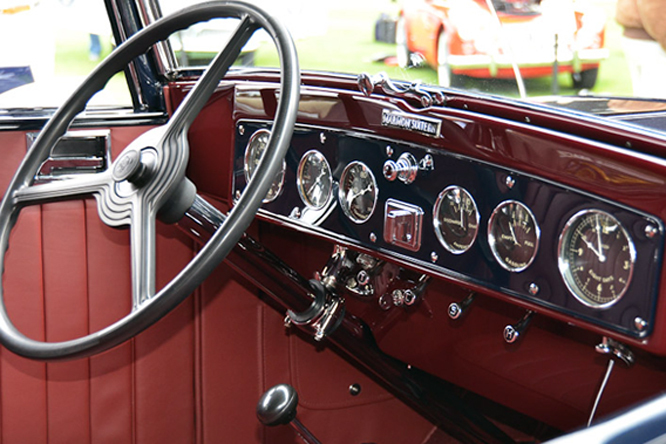 With a superior power to weight ratio, thanks to the extensive use of aluminium, to almost everything else on the road, all Marmon Sixteens were certified has having achieved 100 mph on the fabled Indianapolis Circuit. 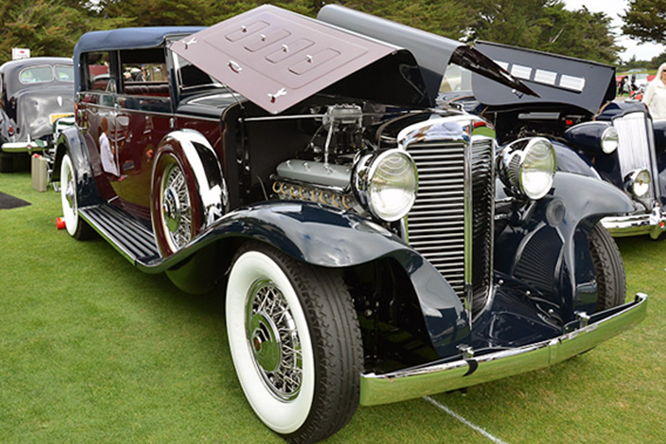 Unfortunately the The Worlds Most Advanced Car, as the Sixteen was marketed, came at absolutely the worst time when the market for $5,000 automobiles was at an all time low and so Marmon left the car manufacturing business when it went in to receivership in 1933. 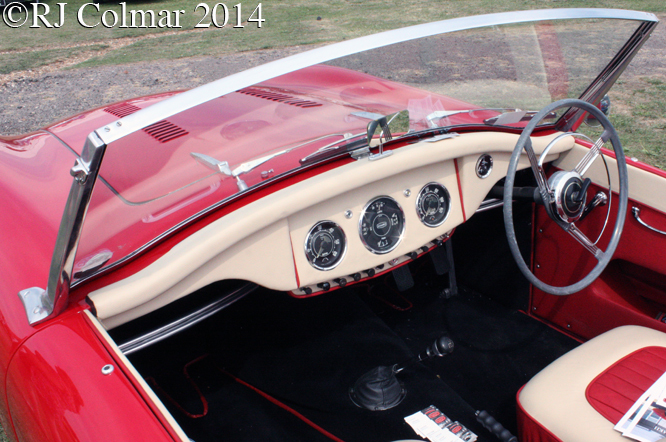 My thanks to Geoffrey Horton for kindly sharing today’s photographs taken at the recent Hillsborough Concours d’Elegance. 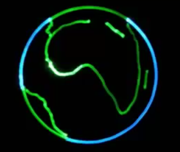 Thanks for joining me on this “The Worlds Most Advanced Car” edition of “Gettin’ a li’l psycho on tyres”. I hope you will join me again for Ferrari Friday tomorrow. Don’t forget to come back now ! This entry was posted in Uncategorized and tagged Colmar, Concours d'Elegance, GALPOT, Geoffrey, Hillsborough, Horton, Howard, LeBaron, Marmon, Ralph, Sixteen, Teague on September 13, 2012 by Ralph.